We are big fans of crisps (understatement) – when we watch Doctor Who we always have crisps as that is The Law. But El does not generally get crisps in her lunchbox as Jae knows that she would rather have an apple or some tasty bark. Mmmm bark. 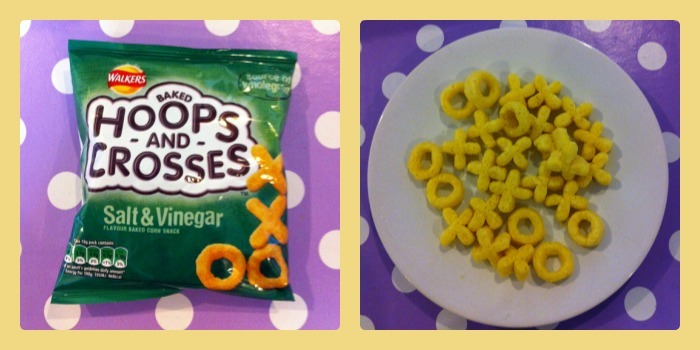 But still, we have been hard at work testing out a new crisp-type snack from Walkers. We were sent a cute & cuddly toy monkey who was clutching a bag of beef flavour Hoops and Crosses. However, since we are vegetarian we didn’t fancy the beef flavour (though it turns out they are actually suitable for veggies – how does that work?). Jae toddled off to the supermarket and bought some of the salt & vinegar flavour which cost £1.80 for a multipack of 6. We love salt and vinegar. Yum nom nom. The reason Jae doesn’t put crisps in lunchboxes every day is mainly because she thinks they’re too salty. Crisps once or twice a week is OK, but any more than that she’s not keen on. El disagrees but Jae won’t listen to her that crisps are what they’re on about when they say 5 a day. This shows you the packet on the left and on the right are the contents. Taste and texture-wise they’re similar to Monster Munch. As a wholegrain product we didn’t notice anything different to other non-wholegrain crispy-type snacks. We like the fact that they are baked rather than fried. When El had a packet in her bag one day it made her super happy! They were quite puffy which was nice as it meant that although there probably wasn’t a lot it felt like there was more. There weren’t so many that it was unhealthy but El didn’t feel cheated of crisps. Plus they didn’t crumble in the bag which means that they were WHOLE! They were satisfying and for once El didn’t feel a bit left out at break time because most of her friends have crisps everyday. May 9, 2013. Tags: crisps, hoops and crosses, walkers. Reviews.